If you are expecting your significant other to propose this year you probably started researching the best engagement ring designers, pinned the prettiest engagement and wedding rings to your secret Pinterest board and, perhaps, even tried a few on. Although we all love those classic engagement ring styles, there are always new engagement rings and designs to consider. If you are curious to see which ring design ideas brides-to-be are swooning over this season, now’s the time to dive into the latest engagement ring and wedding jewellery trends for 2018. Read on as we reveal the best ring designs for the most popular engagement rings and uncover the latest wedding ring trends. The giving and receiving of an engagement ring is one of life’s most rewarding and memorable experiences and one that Shimansky would be delighted to guide you on. We invite you to make an appointment at one of our stores for a one-on-one consultation. As a leading diamond and tanzanite jewellery brand, Shimansky has crafted some of the most iconic engagement rings and wedding rings to date and will offer you a truly personalised experience throughout your ring shopping process (get started with our 5 step guide on choosing the perfect engagement ring). When we look at engagement ring trends by decade it’s clear to see that, similar to fashion styles, certain jewellery trends always make a comeback. The solitaire diamond ring, for example, is a timeless favourite. This classic design has been a popular choice since the 1910s. Skip a few decades ahead – to the ‘40s – and we see white gold becoming a must-have design feature in trendy engagement rings. During the ‘60s platinum engagement rings started becoming popular, while the '90s brought chic radiant cut gems to the foreground. The beautiful halo setting became all the rage in the 2010s – and still remains one of the top engagement ring styles making it an excellent choice for rings today. Now, let’s have a look at some of the other engagement and wedding ring trends for 2018. Traditional diamond cuts will always be popular, and no one knows this better than our top engagement ring designers. While there's always going to be a market for classic engagement rings, we are seeing more and more brides opting for a shape that’s a little bit different – like the pear- or heart-shaped cut – as featured, among other more traditional cuts, in our Millennium Collection. The contemporary-classic Millennium ring is an iconic, signature Shimansky creation, designed with two bands joined by a Shimansky diamond in the middle. The asymmetrical shape created by the two bands formed around the pear- or heart-shaped diamond, makes these masterpieces truly unique and puts them among the most popular engagement rings this season. One of the biggest engagement ring trends in 2018 is opting for a diamond with a unique cut. The “I Do” engagement ring, featuring two elegant hearts that meet in the middle, can be created with a Shimansky-exclusive My Girl patented diamond – the world’s first square cut diamond with a diamond-shaped table, or a Shimansky-patented Brilliant 10 diamond featuring 71 precisely aligned facets for the ultimate display of brilliance. Alternatively, you can opt for a cushion cut diamond – a 19th-century classic cut that is making a big comeback. An engagement ring is more than just a beautiful creation to admire on your finger. It’s a lifelong reminder of your love and commitment. The romantic sentiment of an engagement ring being a profound symbol of the couple’s love and devotion is bringing the heart design to the front this year. The Shimansky Two Hearts solitaire diamond engagement ring offers the ultimate romantic design that is both eye-catching and graceful – two hearts coming together in unity. There is no doubt the halo design makes for one of the prettiest engagement rings. This year, however, it’s more popular than ever. This trendy engagement ring style is not only a great choice for brides who want the centre stone to appear larger without splashing out on a bigger diamond, but it’s the perfect ring to get that dazzling, bright look. The eye-catching My Girl halo engagement ring is designed with delicate micro set round diamonds around the My Girl centre stone, and on the shank, making it shine with the brightest light, with every move you make. 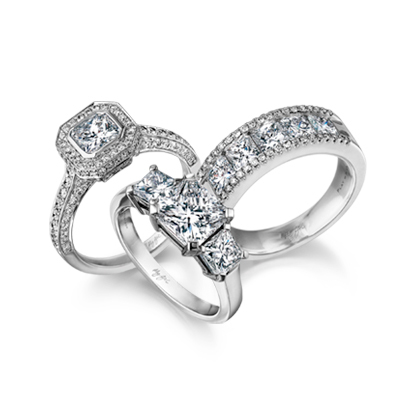 Known to represent the past, present and future, three stone engagement rings have always been a popular choice. This year, however, this design is all the rage, following Meghan Markle and Prince Harry’s engagement. A large cushion cut centre stone with side diamonds was Prince Harry’s choice for Meghan. If you fancy something similar, our Square Emerald Diamond Trilogy ring, crafted in 18K white gold, is an elegant choice. One of the major engagement ring trends 2018 is colourful diamonds or gemstones. Adding colour, whether as the main stone or the accent stones, is a great way to switch up your classic engagement ring and to give it a unique touch. The Fancy Yellow Solitaire ring, for example, featuring a breathtakingly beautiful natural fancy yellow diamond, is perfect for the trendsetting bride who wants a standout ring that makes a statement. Rose gold is still one of the most popular features in trending rings. This year, however, rose gold trends have evolved as more brides are opting for a combination of rose gold and white gold or platinum. Mixing different metals is not only popular in engagement rings and wedding bands, but also in wedding day jewellery for bridesmaids – the Shoreline Mayim rose gold and diamond dress ring is a great example. With the talents of top wedding ring designers and master craftsmen, Shimansky is home to some of the most iconic engagement rings and trendy wedding rings in South Africa, all of which are made to perfection. Book an appointment at one of our stores today to find that unique ring that symbolises your love.